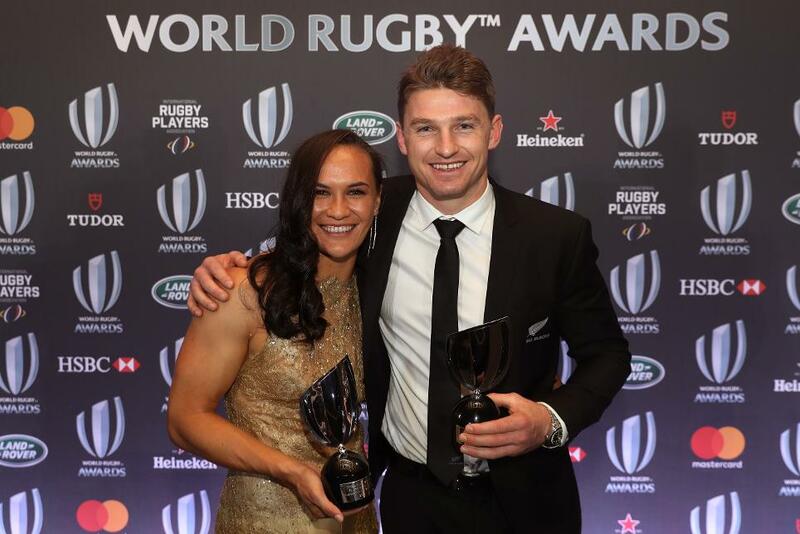 Beauden Barrett and Portia Woodman have been named World Rugby Men’s and Women’s Player of the Year 2017 in association with Mastercard respectively at the World Rugby Awards in Monte Carlo recently. On a night to remember in the presence of Their Serene Highnesses Prince Albert and Princess Charlene of Monaco and greats of the game past and present, the rugby family celebrated some outstanding achievers. Barrett becomes only the second player to win the prestigious award two years in a row, matching the achievement of his former All Blacks captain Richie McCaw from 2009-10. He received the award ahead of four other nominees in All Blacks team-mate Rieko Ioane, England and British Lions duo Owen Farrell and Maro Itoje and Australia full-back Israel Folau. She received the award ahead of four other nominees in Black Ferns team-mate Kelly Brazier, England winger Lydia Thompson and France back-row duo Romane Menager and Safi N’Diaye. “From the players, teams and coaches who have inspired millions of fans to the unsung volunteers and projects who at community level are the foundation of our great game, we salute them all. The award winners were selected by an independent panel, who voted on every match from the Six Nations through to the start of the November internationals. New Zealand won a fifth Women’s Rugby World Cup title in August after beating defending champions England 41-32 in a thrilling finale in Belfast, a result which took them back to the top of the World Rugby Women’s Rankings. The Black Ferns, with coach Glenn Moore and captain Fiao’o Faamausili leading the way, were the top point and try scorers in the tournament. This success came after New Zealand hosted the International Women’s Rugby Series in June with the hosts beating Australia and Canada before losing to England. New Zealand are the first women’s team to receive the accolade. Now in his second year, Eddie Jones has led England to nine victories in 2017 with the only loss coming against Ireland in the Six Nations finale to halt his winning run as coach at 17 tests. A second Six Nations title was followed by a two-test series win in Argentina in June and victories over Argentina, Australia and Samoa this month to take his record to 22 wins in his 23 tests in charge. The winger marked his All Blacks debut last November with a try against Italy, but it is in 2017 that Rieko Ioane truly made his mark on the international stage with 10 tries in 11 starts. The 20-year-old scored twice in his first start against the British and Irish Lions at Eden Park and claimed another double in his first Bledisloe Cup match in August. Blessed with pace and strength, Ioane was joint-top try-scorer in the Rugby Championship with five after beating the most defenders, making the most clean breaks and metres in the competition. The oldest of the nominees at 31, Perry Baker enjoyed a season to remember in 2016-17, topping the charts for tries and points scored on the HSBC World Rugby Sevens Series with 57 and 285 respectively. The USA Eagles flyer has electric pace and can make something out of nothing, but has now developed the all-round game to go with his natural speed. Michaela Blyde enjoyed a breakthrough season in 2016-17 under new Black Ferns Sevens coach Allan Bunting. Her potential had always been clear to see, but Portia Woodman’s move into the forwards gave her the chance to make a starting spot her own. Blyde’s performances saw her finish as top try-scorer with 40, take her place in the HSBC World Rugby Women’s Sevens Series Dream Team and be named DHL Impact Player of the Series. After more than 14,000 votes were cast by rugby fans on Twitter and guests at the World Rugby Awards, Joaquin Tuculet’s score for Argentina in the first test against England in June was named the IRPA (International Rugby Players’ Association) Try of the Year 2017. A breakout that began deep in his team’s own 22 after Juan Manuel Leguizamon fielded an England kick and the ball found its way to Matias Orlando, the centre slicing through the visitor’s defence with ease. He found Emiliano Boffelli in support, the test debutant straightening the attack before releasing Tuculet to sprint away from the defence to finish off the free-flowing move.